One of the "must eat" when visiting Hong Kong is Dim Sum. 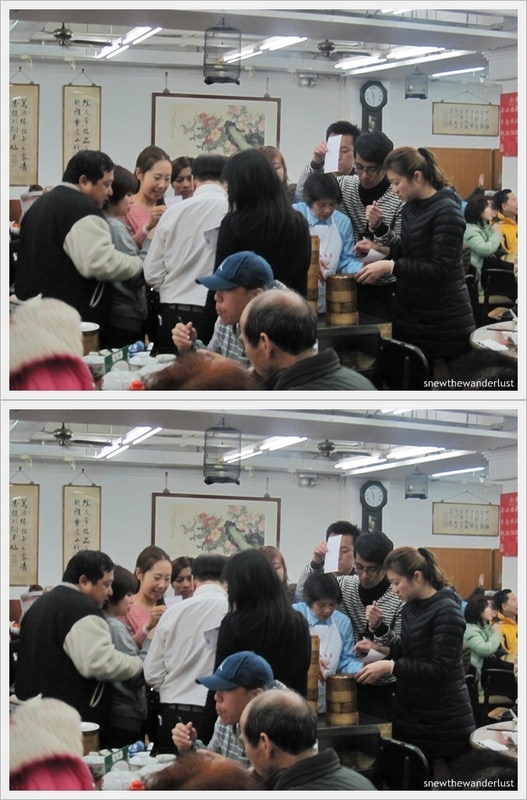 Yum Cha 饮茶- one of the favourite pastime for Hong Kongers, is especially popular among the older folks. You see them bringing newspapers, with a few dishes, and sitting there sipping tea or waiting for their tea companion. This seems to be their favourite pastime. Althought the literal Cantonese translation of Yum Cha means 'drinking tea', it usually involves a Chinese style of drinking morning or afternoon tea with Dim Sum. This place was introduced by Ms Sumo's brother who was based in Hong Kong for 6 months internship. It's an old tea house patronised usually by the elders. It was really crowded when we arrived. Three of us - Ms Sumo, Ms Tiny Gal and myself got to split up to wait for pockets of seat. Of course, we have to share table with someone as most of the tables are tables of 8 or 10. Check out the crowd! Most of the guests are the elderly couples. Armed with newspaper, they are really enjoying their leisure time. But I wonder how they could do it? The place is in a mess and you need to squeeze with others in a table. Nobody attended to us when we arrived. The practice is, you just have to spot and wait for your empty seat. Finally, I managed to get seats for us at the corner. A kind-hearted lady spoke to me in Cantonese that the guests just left. The trick is, you have to be fast and thick-skinned to spot and ask in my half-broken Cantonese. We also spotted tourists amongst the locals. Seems like this place is growing in popularity. Once you settle down, the staff would come to you with an order chit, utensils and check with you for your order for tea. Pu Er (Poh Lei) is usually the popular tea in Hong Kong. Unlike in Singapore, the restaurants are usually very generous in the tea leaves. Tea are drank thick with a strong aroma. The colour of the tea is usually dark, compared to the pale yellowish in Singapore. Besides our tea, we were also given a pot of hot water and a bowl to rinse our tea cups, chopsticks and spoons. Don't mistake this and use it as a bowl! In the photo below, the centre bowl is the one for you to rinse your utencils with hot water. Next, we have to compete with other guests for food. Although the staff are supposed to push the carts around the tables. But rarely do they have a chance to do it. The guests will just horde up the staff and "fight" for the food. Everyone would be shouting out their orders and pressing the order chit to the staff for their order. Again, you just have to join the crowd to battle for the food. Being nice, slow or expecting service by standing there waiting for your turn will just get you nowhere. We were starving so we just try and grab whatever food that is available. Steamed Fish Head and Mixed Rice looks not bad. Anyway, after much elbowing against other guests (just kidding! ), we managed to get our much awaited dose of Dim Sum. For the sweets, we have the Malay Cake 马来糕 and Lotus Paste Bun 莲蓉包 that looks like the Custard Bun in Singapore. However, it's not Custard. It's pure Lotus. We have a total of 9 dishes with tea. For just the three of us, it's really a bit too many. Even the local aunty besides us who chatted us up was impressed by the amount of food we have, and our ability to search for this place for Dim Sum. Well, we were starving. And it took us the whole morning to travel from Kowloon to Hong Kong Island and search for this place. With the amount of food that we have, paying about HK$200 is well worth it. The dim sum are all traditional hand-made. If you are looking for a traditional teahouse to experience the lifestyle of the locals, this is a great place to try. However, if you want to enjoy dim sum without the hassle of waiting for, and the mad rush for food, then I recommend the next place that I'm going to introduce - Tao Heung 稻香. After our failed attempt at Tim Ho Wan (scroll down to read the following), we actually have a back-up plan. That is, to eat in peace and comfort at Tao Heung. Tao Heung is a popular group of restaurant chain with many branches in Hong Kong. Together with the chain is the Cheers Restaurant which caters to wedding bouquets as well. Just ask any hotel concierge for recommendation of Dim Sum and Tao Heung will always be one of the recommendation. We went to the outlet at MongKok, Grand Tower as it was just walking distance from Tim Ho Wan. As we reach Grand Tower, the Tao Heung restaurant's receptionist was stationed at the lobby level of the building. She keeps telling us to proceed to level 4 instead (of level 3) as she convince us that we do not need to queue at Level 4 and also do not need to share table with other guests. The smart Ms Sumo told us that usually that would mean paying a higher price at level 4. We checked with the receptionist and she admitted that, adding that it is just a little incremental in price. We decided to check-out how bad a queue was in level 3. To our surprise, there wasn't a queue, and we were ushered to table of our own. Luckily, we did not listen to the advise of the receptionist, else, we would be paying a higher price for nothing! The dim sum is really delicious. Well, it's a full fledged restaurant, so the quality of food and service is honestly better. Unlike the Siew Mai that comes with minced meat in Singapore, the Siew Mai here is wrapped with generous fresh prawns. Comparing the taste of Lin Heung Tea House 莲香楼, I think the dim sum at Tao Heung taste nicer. I'm not sure if it's based on the overall experience. At least, over here, we eat in comfort, peace and just waive our hands at the staff on what we need. I can't remember how much we paid for the bill. But the price is not much difference from what we ate in Lin Heung Tea House. We've read so much about this popular Tim Ho Wan dim sum place. Well-known for its one-star Michellin rating, and undoubtedly, the cheapest restaurant with such a rating. So, despite reading on the warnings of long queue lines and waiting time, we still decide to give it a shot, hoping we will have some luck. When we arrived, there's a large crowd infront of the shop. However, looking at the crowd, our heart sank. I guess, deep in our hearts, we have kind of give up. It was 10.30am, and we are not prepared to wait for hours for our food with an empty stomach. Finally, a staff came out, and our heart died. He told us that there's no more queue number. Ok, this is what we learn. There will only be 130 queue numbers given out every morning. Either you wait for the queue number or come back before 3pm. Another batch of 60 queue numbers would be give out at 4pm, to be used by 8.30pm. There are two other outlets, one in Sham Shui Po & Central. However, the reviews given that the taste in these two outlets pale in comparison to the original. Too bad it was our last day, and we are not prepared to wait so long. I'll return one day to try. 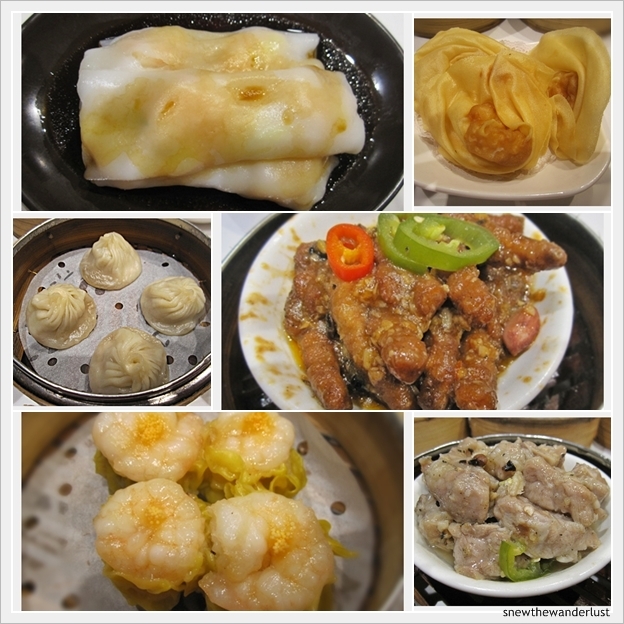 Do let me have your comments and reviews if you have tried the dim sum at Tim Ho Wan.